Is service the new sales? According to Greg Gianforte, CEO and founder of RightNow, not only is this a true statement but sales is the highest form of service. In a recent podcast interview with Yours Truly, Gianforte explained how companies are focusing more heavily on service and moreover how his company is providing CRM solutions to customers which lowers costs and increases productivity. He further explained the details of his book titled Eight to Great which focuses on how to provide an exceptional customer experience. One of the more exciting conferences I have attended lately has to be the Dialogic One Event at the Hotel Del Coronado in San Diego, CA. Rob Martinez, VP Sales Americas kicked off the event, speaking to global partners from over 125 companies who were in attendance at the kickoff session last night (see pictures throughout). Martinez thanked the enthusiastic crowd and sponsors and explained what we would see over the next few days. After a short intro, Martinez handed the microphone and stage over to Nick Jensen, the President and CEO of Dialogic. Jensen was right at home on the stage and as always, was full of passion and enthusiasm. One of the people with a long history in the communications space is Neal Shact (pictured) -- CEO of Communitech Services. In the past, Shacht has been a distributor in the headset market and has been early in many new markets such as VoIP, call centers and others. Shact points out it is impossible for customers to know what they want in UC. He mentions the old story that Henry Ford once said people when asked what they wanted in transportation said, a faster horse. His point: you need a communications roadmap. Don't rely exclusively on your UC vendor to dictate what you want and need. You want to check out this podcast as it is rife with references outside communications -- and the tie-ins are fascinating. 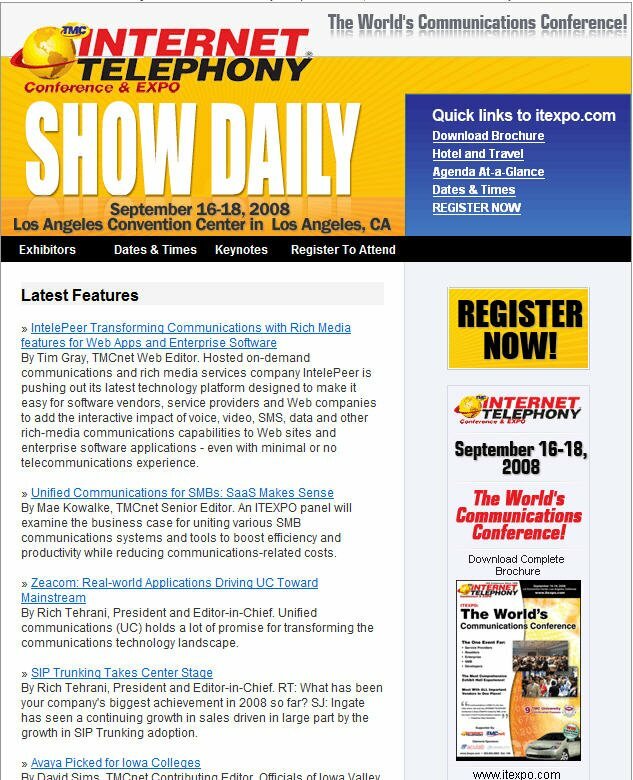 I just came across an article by Richard Zippy Grigonis regarding the success of ITEXPO in light of the incredible competition over the years. Reading it, reminded me of shows of the past which I enjoyed going to. Zippy -- as many of you know is about the straightest-shooter there is -- he tells it as it is -- from his vantage point of course. This is what makes his thoughts are all the more incredible (and humbling) -- and Zippy -- you are part of the team that allows ITEXPO and TMC in general to flourish. Of course while i am in thanking mode -- getting ready to head out to LA for ITEXPO myself -- let me extend a hearty thanks to the entire TMC team, our advertisers, sponsors, exhibitors and partners who have allowed TMC to keep growing. I look forward to seeing you all and thanking you in person this week. Texas Instruments makes the DSPs which perform much of the heavy lifting in communications devices we commonly use. From cell phones to VoIP gateways, TI DSPs and other processors are likely to be in in the equipment we use. To help us understand how TI helps deliver world-class voice and other solutions, we have invited Fred Zimmerman, Director, CPE VoIP Solutions for Texas Instruments' Communications Infrastructure & Voice Business to deliver a keynote address at the upcoming Communications Developers Conference taking place in Los Angeles at the LA Convention Center, September 16th to the 18th. His topic will be case study focusing on the SMB market -- one which is really poised for growth. Zimmerman will give a call to action to VoIP vendors selling into this market. The SMB has unique challenges -- and these extend into the infrastructure according to Fred. Zimmerman's case study discusses a small service provider and will delves into where the rubber meets the road in SMB VoIP deployment. Here is a podcast with Greg Galitzine which has details and both Greg and Fred do a great job. You know what? I was looking at Tom Keating's blog today and there is some good stuff worth sharing. First he points to an Om Malik interview of Josh Silverman the CEO of Skype and then reminds us of how to get Skype to run on an iPhone (sort-of) until Skype releases an official version. The interview is great -- it shows Skype is laser-focused on profit, mobility and embedding itself into other applications. Malik pushed Silverman on a few fronts -- explaining that the telcos aren't a monopoly (contradicting my thoughts and those of Silverman) -- he also pushed Silverman on why they are still part of eBay and finally on why Skype is boring. ITEXPO West 2008 attendance for the upcoming Los Angeles, California event to be held September 16-18 is looking great and I just can't wait for the show to start. We are brimming with enthusiasm about this year's event and it will truly be the World's Communications Conference. Perhaps the most exciting thing about this year's show is the record number of companies making news at the show. We are absolutely thrilled about this and are doing our best to help you absorb all the news emanating from the show in an easily digestible format. Whenever I go to a conference, I learn a tremendous amount from the people I meet at the show. I really enjoy the impromptu networking which takes place at events as it allows me to learn so much about what is happening in the market. Ironically, I generally learn things I didn't think I would learn ahead of time. Quite often, I wish I would have known more about peoples' experiences before I met with them as it would allow me to be better prepared to ask pertinent questions. I further wish I knew who was coming to events and and moreover I wish I could get a "brain dump" from them before the event so I could have a frame of reference before our conversations take place. Imagine how much better networking at a show would be if I had an idea what people were generally thinking about the market before I even say hello. In less than two weeks the world with gather at ITEXPO -- The World's Communications Conference to help select products for purchase, learn about the latest events in the telecom market and network with peers. It is this last area where this blog entry should be of maximal benefit.